Some months ago a man pointed out us that the foreing people imagine Sicily dry and yellow but it’s because they come here in July or August and they marvel of the colours of our lands in April. 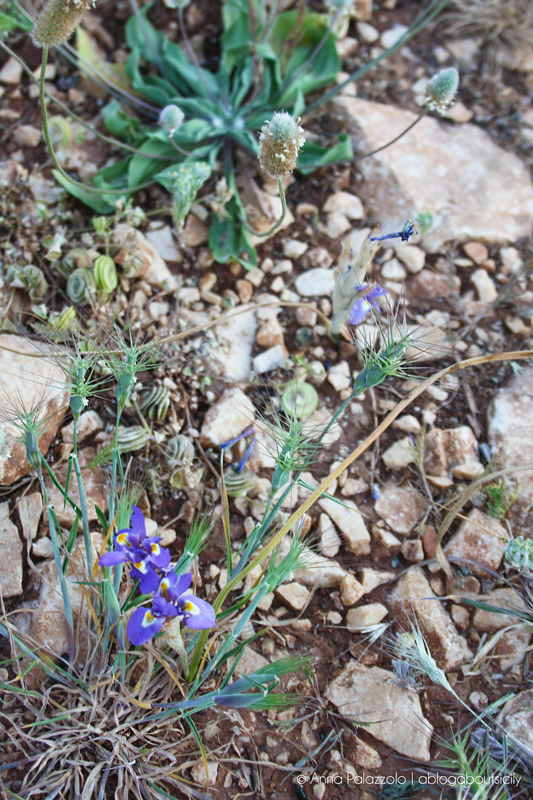 The Sicily isn’t nearly barren! I wrote this post for the first time in italian during the passage from a very rainy winter to a scorching summer preview, in the end of April. There wasn’t spring this year but luckily I never shifted the clothes in my wardrobe this year. It’s prevision (presage? ), not extreme disorganization. 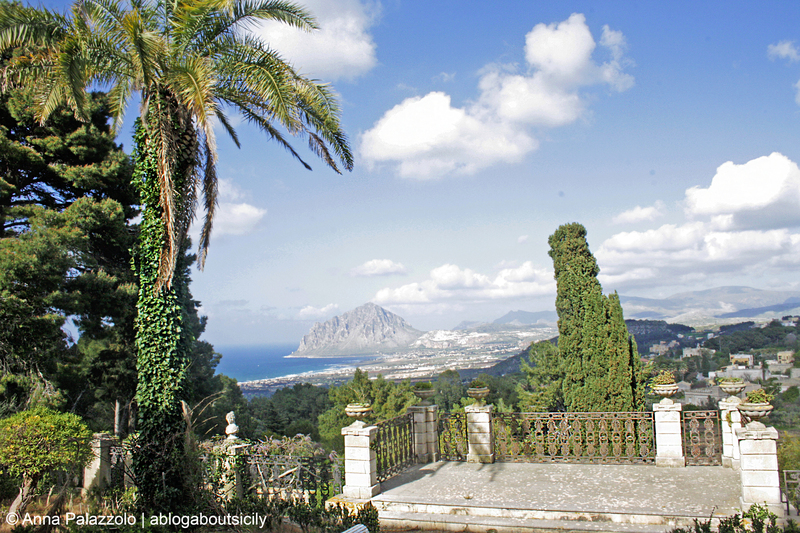 And in those days before the “terrible” sicilian summer I walked and walked and know I show the sicilian country in spring. In April the lands are full of “Sulla” (Hedysarum coronarium), that is fuchsia flowers for happy cows. 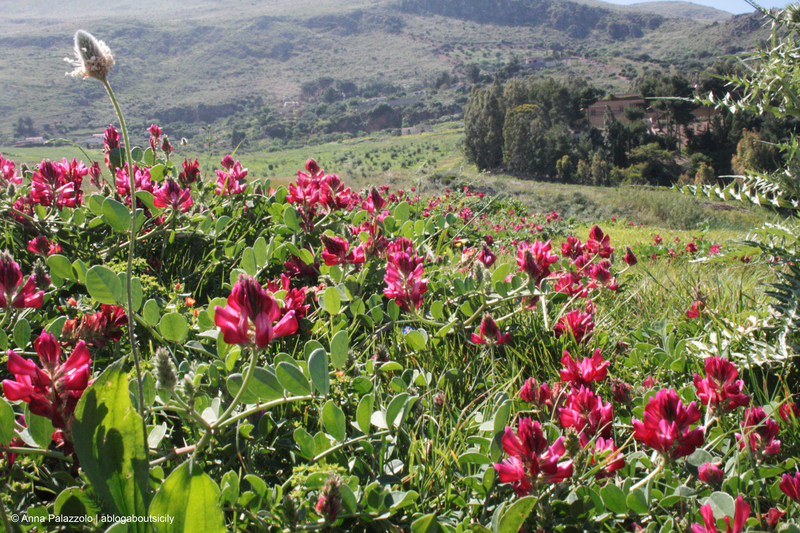 It’s a native plant in Sicily and there are big fuchsia carpets in this month, also because it was planted specifically for pasture. It’s appreciated by cows and bees. It can be eaten in salad or omelet, both flowers and leaves, but I don’t know its taste. If you don’t like new age salads you can put them in a pot, they are long-lasting. “Wood-sorrel” (in italian: Acetosella gialla, Oxalis pes-caprae), that before I knew as “The flower with stem tastes like lemon”. 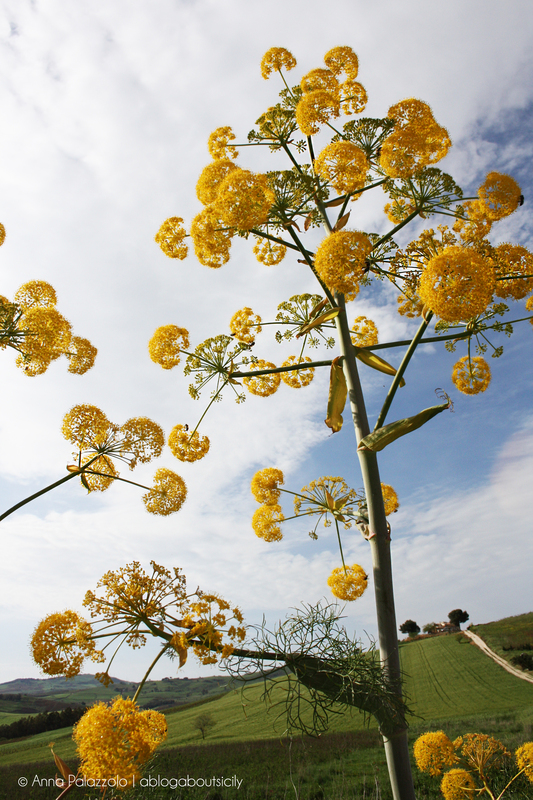 Doing searching on Internet I found this definition: growing over, (in Sicily it’s wherever) but it’s so nice with its lemon yellow flowers that it isn’t kind define it like this. Also this plant can be used in salad but you can also take one and squeeze the stem by teeth, it has a light sour taste. I suggest you to eat only the flowers picked up in open country, it’s less probable that a dog went pee on. Eat it little because the oxalate acids are harmful to kidney. 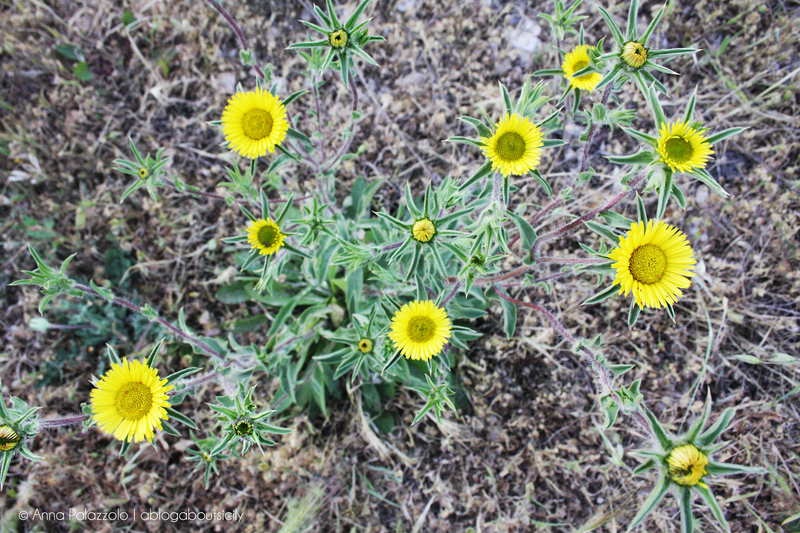 I think it’s the most typical and nice wild plant in Sicily. 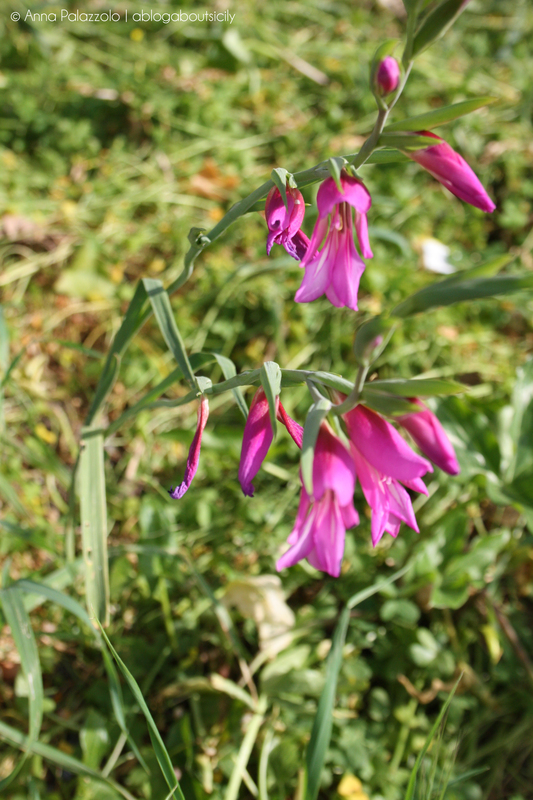 The wild gladiolus (Gladiolus italicus), the Poetess and me picked up many and many of them during our walks, while the two Nespule looking for us alone, sad and disconsolate. They have fuchsia-violet flowers and we tried to plant them because they are simple but really elegant. They are frail, don’t leave them under the sun after harvest them. I couldn’t reproduce them in the vase, of course. 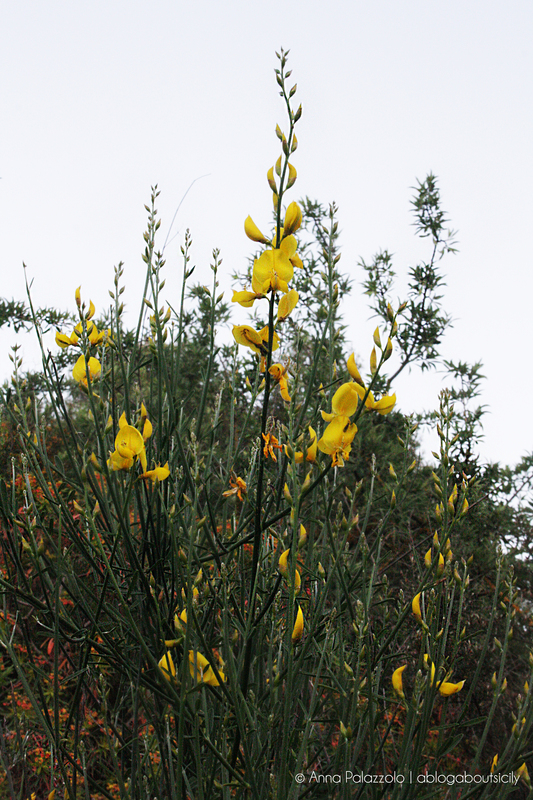 The broom, that plant much loved by your mother,reason why your father didn’t hesitate to stop in motorway to harvest big bundles of them. This is my (very old) memory of this plant with yellow flowers. – Memory number 2: they have a terribly hard trunk, you have to use a knife to cut them (their fibre was used to make ropes). – Memory number 3: they smell nice and the bees like them (I discovered this particular while daddy, unflappable, harvested them next to me O_O). – Memory number 4: They are very resistant and few discerning but they can be infested by aphids (I discovered this hugging a big bundle for my mother ). – Memory number 5: my mother liked them very much. – Memory number 6: that evening had on tv the terrible movie ‘The House of the Spirits‘. Poppies! 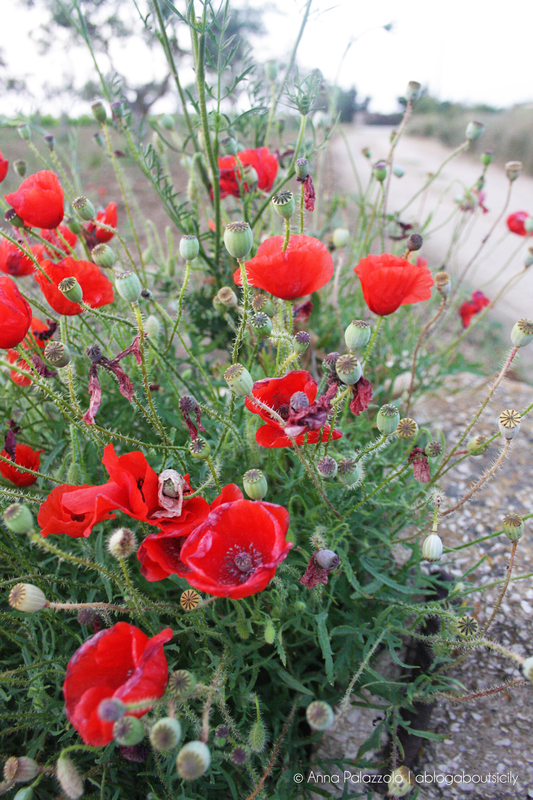 By now I don’t see many of these nice red flowers but when me and my brothers were children, our mother took us to see big exquisite red lands surronded by buildings at the Trapani periphery. I’m sorry their fragility, you can’t harvest and put them in a pot to have a happy awakening. Yellow and violet cardoon, in the end of April they are everywhere in Sicily. They are infest but nice, it’s a Lady Gaga Flower. 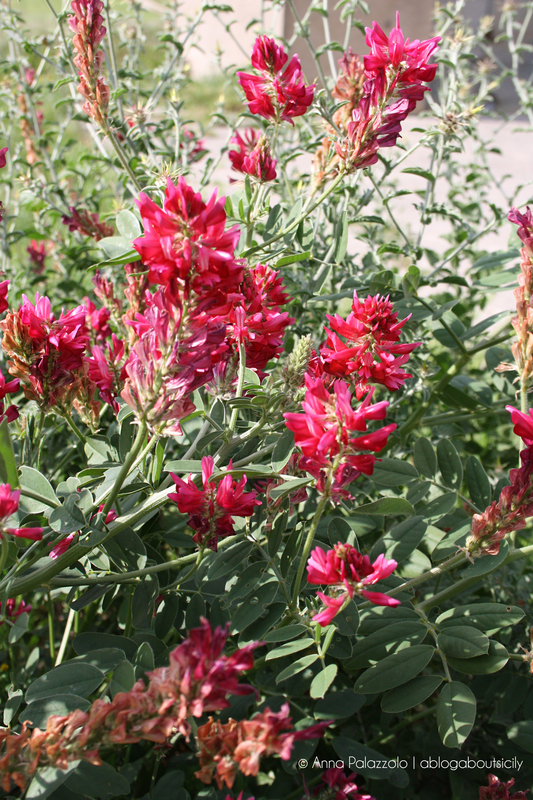 It’s also the flower that reminds the sicilian shepherd Dafni, his parents were Hermes god and a nymph. He was beautiful like all shepherds of greek mythology (but their beauty genes are lost in current shepherds). Dafni was killed by his betrayed nymph-girlfriend and the Earth created the cardoon because of the pain. 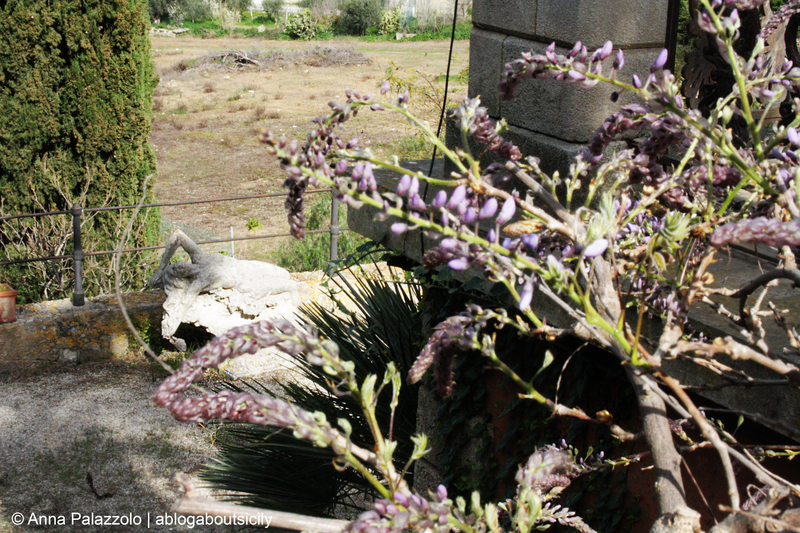 I love pictures of flowers, I HAD TO write a post about flowers in Sicily. I walk slowly and I’m always the last of my group but I like take pictures of them and their evanescent beauty. When I see again these pictures it’s as remembering little happy memories, just for one moment. They don’t make you definitively happy or solve your problems but 5 minutes of beauty every day refresh the heart. Ever. Every post begins with the usual introduction dictated by my guilt: I haven’t time, please forgive me 😥 Pictures increase every day that goes by and they terrorise me. I’m slow like a sloth and I push back the moment to sort them continually. Why do I take so many pictures? Why? Anyway it’s spring and, above all, it’s time of spring cleaning and I began to organize my files 😦 and I found these pictures that, strangely, are only two weeks old, I took them on Easter Monday. Anyway this year we spent a troubled Easter, Giovanni was busy with cooking class, our friends were occupied to carry “Misteri” during Good Friday, the girlfriends were busy to support the bearers positioned under Misteri (Misteri are ancient wooden sculptures which represent Jesus Pain and are exhibit in a famous parade in Trapani old town between Good Friday and saturday. They weight many hundreds of kilos and girlfriends are important to accompany the experience with pictures and support the men with an adoring suffering look…mmm) and nobody organized arrustuta, no shopping, no money raising, no land…no big meal??? NOOOOOOOO, IMPOSSIBLE!!! We hadn’t a mind to give up the meat meal and we did an absurd thing. We gatecrushed to another barbecue party (is it correct???? Help me!) O_O , I came back to high school. But we didn’t want to do it, it was a coincidence. Our friend Natale (Yeah, “Christmas” the translation is correct 😀 ) has a sister, Marzia, and Marzia was invited by her friend to an arrustuta. She knew only that girl and we knew NOBODY 😀 but it wasn’t important, we just needed a grill for meal, a table and a bathroom with water 😀 . We raised money, two saints went to buy food at supermarket and we went in search of this place. It was at Valederice! Valderice is just 8 Km far from Trapani. It’s only a village and once its name was Paparedda, little duck in sicilian dialect 😀 I don’t know the reason. This village is among hills but its territory includes a long coast and receives many stressed people from the “big town” Trapani in summer. (stressed? in Trapani? are you sure?). Arrived to Paparedda we began to search the house. It was hidden , beyond a gate at the end of a long tiny street. This is the house we found. O_O but who are Marzia’s friend’s friends??? 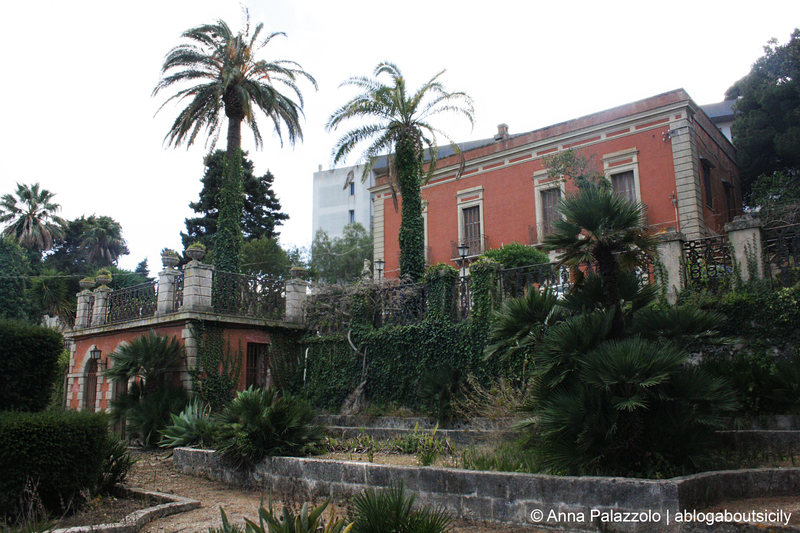 Gatecrushers asked themselves…fortunately they weren’t owners of this villa but of another next one. Second explanation are starting…-3, -2, -1 are you ready? Valderice is famous for numerous “bagli” (“baglio” is an ancient residence extends around a courtyard and includes rooms, stables, cellars and larders. It was the house for big families, with many generations. The owners of bagli were often well-to-do peasants and these residences were surronded by their lands). Valderice is famous for noble villas too. We were in front of (but only in front of) one of these villas, that is on the top of a hill with Cornino Bay and Monte Cofano view. “Our” barbecue was at a near villa but in the same plot. Sustaining a such villa and its big garden (see the pictures below) is too expensive and probably owners sold the plot in bits, for this reason there is that horrid grey building back the wonderful amazing dream villa and other houses. Fortunately they kept a part of garden and the spectacular terrace with Cornino Bay view _ and The Poetess and I had to walk and look around it 🙂 …and took pictures of this place, of course, there are Monte Cofano, the yellow jasmine and a mawkish stone girl back wisteria, we couldn’t resist temptation.